A popular trip from Bangkok, Ko Samet provides a getaway with white-sand beaches, clear waters, and coral reefs teeming with fish. Your itinerary includes some good beach time at Ao Wai and Ao Cho. Get outdoors at Sai Kaew Beach and Ao Prao Beach. Next up on the itinerary: enjoy the sand and surf at Ao Kiu Na Nok, stroll through Ao Phai, and head outdoors with Ao Nuan. To see maps, photos, and other tourist information, read our Ko Samet travel tool . New Delhi, India to Ko Samet is an approximately 11.5-hour flight. You'll lose 1 hour traveling from New Delhi to Ko Samet due to the time zone difference. Expect little chillier weather when traveling from New Delhi in August: highs in Ko Samet hover around 37°C, while lows dip to 30°C. Wrap up your sightseeing on the 4th (Sat) to allow time to travel to Similan Islands. Divers across the globe come to the Similan Islands to holiday. Kick off your visit on the 5th (Sun): stroll through Mu Ko Similan National Park. To find maps, where to stay, reviews, and tourist information, read Similan Islands road trip website . The Route module can help you plan travel from Ko Samet to Similan Islands. August in Similan Islands sees daily highs of 36°C and lows of 28°C at night. Cap off your sightseeing on the 5th (Sun) early enough to travel to Patong. 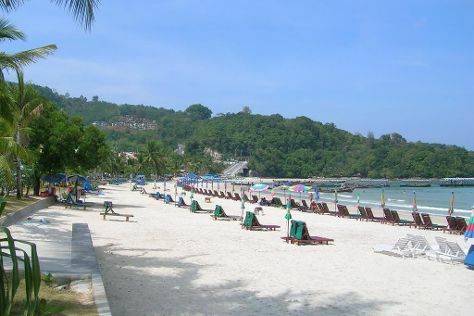 Step out of the city life by going to Patong Beach and Nai Harn Beach. Your itinerary includes some good beach time at Karon Beach and Kata Beach. Venture out of the city with trips to Rawai (Rawai Beach & Andys Scuba Diving Phuket) and Wat Chalong (in Chalong). The adventure continues: soothe aching muscles at some of the top local wellness centers, kick back and relax at Nai Yang Beach, get great views at Karon View Point, and stroll through Freedom Beach. To see traveler tips, ratings, photos, and more tourist information, read our Patong journey planner. The Route module can help you plan travel from Similan Islands to Patong. In August in Patong, expect temperatures between 36°C during the day and 28°C at night. Finish up your sightseeing early on the 10th (Fri) so you can travel to Ko Phi Phi Don. Step out of the city life by going to Maya Bay and Laem Tong Bay. Your itinerary includes some good beach time at Ao Ton Sai and Loh Dalum Beach. Spend the 13th (Mon) among aquatic life with a scuba or snorkeling tour. And it doesn't end there: enjoy the sand and surf at Monkey Beach, don't miss a visit to Koh Phi Phi Viewpoint, stroll through Nui Beach, and Head underground at Ko Phi Phi Le. For more things to do, where to stay, other places to visit, and other tourist information, read our Ko Phi Phi Don trip itinerary maker tool . Getting from Patong to Ko Phi Phi Don by combination of taxi and ferry takes about 1.5 hours. Expect a daytime high around 36°C in August, and nighttime lows around 27°C. Finish your sightseeing early on the 14th (Tue) so you can ride a ferry to Krabi Town. Visit Railay Beach and Ao Thalane for some beach relaxation. 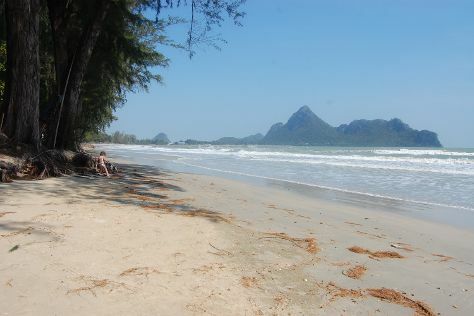 Get outdoors at PhraNang Cave Beach and Khlong Muang Beach. Next up on the itinerary: enjoy the sand and surf at Ao Nang Beach, take some stellar pictures from Railay Beach Viewpoint, take in the spiritual surroundings of Tiger Cave Temple (Wat Tham Suea), and stop by Scandi Fashion. For maps, other places to visit, reviews, and other tourist information, go to the Krabi Town trip planning site . Getting from Ko Phi Phi Don to Krabi Town by ferry takes about 1.5 hours. Other options: do a combination of ferry and bus. 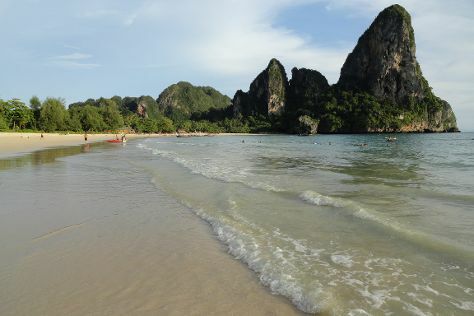 In August in Krabi Town, expect temperatures between 36°C during the day and 27°C at night. Finish your sightseeing early on the 20th (Mon) to allow enough time to travel to Chiang Mai. Escape the urban bustle at Nature & Wildlife Tours and Doi Inthanon. Popular historic sites such as Wat Phra That Doi Suthep and Wat Phra Singh are in your itinerary. Venture out of the city with trips to Wat Phra That Hariphunchai (in Lamphun), Thai Elephant Home (in Mae Taeng) and Thai Elephant Conservation Center (in Lampang). Next up on the itinerary: soothe aching muscles at some of the top local wellness centers, admire the striking features of Wat Chet Yot (Wat Maha Photharam), contemplate in the serene atmosphere at Wat Chiang Man, and stroll through Dragon Flight. For reviews, other places to visit, and more tourist information, refer to the Chiang Mai trip planning app . You can do a combination of bus and flight from Krabi Town to Chiang Mai in 4 hours. Other options are to drive; or do a combination of taxi and train. In August, daily temperatures in Chiang Mai can reach 38°C, while at night they dip to 28°C. Finish up your sightseeing early on the 28th (Tue) so you can travel to Bophut. Rocky cliffs and sandy bays draw visitors looking for a action along the coastal area in Bophut, where diving and snorkeling opportunitys abound. Get a sense of the local culture at Fisherman’s Village and Big Buddha. Escape the urban bustle at Maenam Beach and Chaweng Beach. 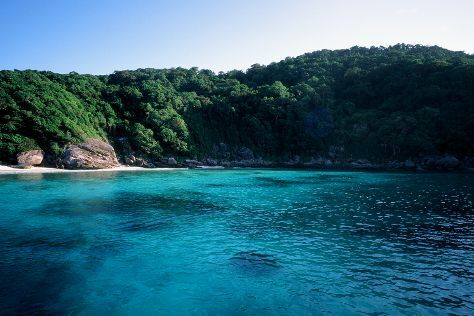 Get out of town with these interesting Bophut side-trips: Fisherman Pants Shop (in Lamai Beach), Thong Takhian Beach (Silver Beach) (in Maret) and Mu Ko Ang Thong National Marine Park (in Ang Thong). Spend the 2nd (Sun) among aquatic life with a scuba or snorkeling tour. Pamper yourself for a day on the 3rd (Mon) at some of the top local wellness centers. And it doesn't end there: enjoy the sand and surf at Lamai Beach, stroll through Choeng Mon Beach, and stop by Dao Siam Cosmetics. To see where to stay, traveler tips, other places to visit, and tourist information, you can read our Bophut holiday builder site . You can do a combination of flight and taxi from Chiang Mai to Bophut in 2.5 hours. Alternatively, you can do a combination of train and bus; or take a bus. In August, plan for daily highs up to 38°C, and evening lows to 31°C. Wrap up your sightseeing on the 3rd (Mon) to allow time to travel to Ko Pha Ngan. Visit Salad Beach and Bottle Beach for some beach relaxation. Take a break from the city and head to Thong Nai Pan Noi and Haad Yao Beach. Spend the 8th (Sat) among aquatic life with a scuba or snorkeling tour. There's much more to do: kick back and relax at Haad Yuan Beach, tour the pleasant surroundings at Ao Plai Laem, explore the wealth of natural beauty at Thansadej Koh Phangan National Park, and have fun at Kobra Muay Thai Boxing Stadium. To see ratings, maps, more things to do, and other tourist information, go to the Ko Pha Ngan route maker site . 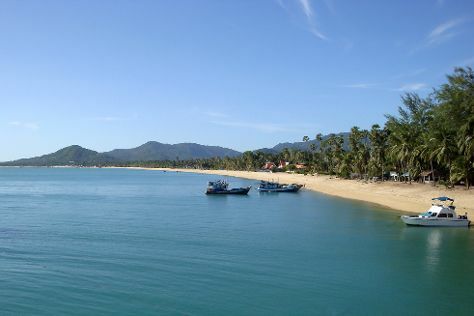 You can do a combination of taxi and bus from Bophut to Ko Pha Ngan in an hour. Another option is to take a bus. In September, plan for daily highs up to 38°C, and evening lows to 31°C. Wrap up your sightseeing on the 9th (Sun) to allow time to ride a ferry to Koh Tao. 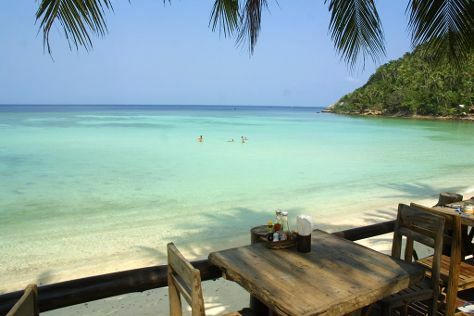 A holiday in Ko Tao ensures a mix of adventure and relaxation on a fast-developing island in the Gulf of Thailand. Step out of the city life by going to Scuba & Snorkeling and Jansom Bay. Visit Ao Tanot Bay and Lighthouse Bay for some beach relaxation. On the 14th (Fri), spend a cool day on the water with Unseen Tours Koh Tao. Next up on the itinerary: enjoy the sand and surf at Sai Nuan Beach, stroll through Rocky Bay, trek along John-Suwan Viewpoint, and head off the coast to Koh Nang Yuan. For ratings, other places to visit, more things to do, and more tourist information, read Koh Tao road trip planning website . Getting from Ko Pha Ngan to Koh Tao by ferry takes about 2 hours. In September, plan for daily highs up to 38°C, and evening lows to 31°C. Finish your sightseeing early on the 15th (Sat) so you can travel to Hua Hin. The seaside town of Hua Hin serves as a popular coastal retreat for Bangkok residents and international tourists. Step out of the city life by going to Ao Manao and Hua Hin Beach. We've included these beaches for you: Suan Son Pradipat Beach and Khao Takiap Beach. Take a break from Hua Hin with a short trip to Wildlife Friends of Thailand in Tha Yang, about 44 minutes away. There's lots more to do: tee off at Banyan Golf Club, learn about winemaking at Monsoon Valley Vineyard, make a trip to Wat Phuttha Chaiyo, and contemplate the long history of Klai Kang Won Palace. To see traveler tips, maps, reviews, and other tourist information, go to the Hua Hin trip maker site . Traveling by combination of ferry, train, and taxi from Koh Tao to Hua Hin takes 7.5 hours. Alternatively, you can do a combination of ferry, flight, and car; or do a combination of ferry, bus, and taxi. In September, plan for daily highs up to 38°C, and evening lows to 29°C. Wrap up your sightseeing on the 20th (Thu) early enough to drive to Bangkok. Step out of the city life by going to SEA LIFE Bangkok Ocean World and Safari World. Do some cultural sightseeing at The Grand Palace and Temple of the Emerald Buddha (Wat Phra Kaew). Explore the numerous day-trip ideas around Bangkok: Ayutthaya (Wat Yai Chai Mang Khon, Ayutthaya Ruins, & more). The adventure continues: contemplate in the serene atmosphere at Wat Pho, admire the striking features of Jim Thompson House, buy something for everyone on your list at Siam Paragon, and make a trip to Khao San Road. To find maps, traveler tips, ratings, and other tourist information, you can read our Bangkok day trip planner. Drive from Hua Hin to Bangkok in 3.5 hours. Alternatively, you can do a combination of taxi and train; or do a combination of taxi and bus. In September, daily temperatures in Bangkok can reach 38°C, while at night they dip to 30°C. Finish your sightseeing early on the 29th (Sat) to allow enough time to travel back home.